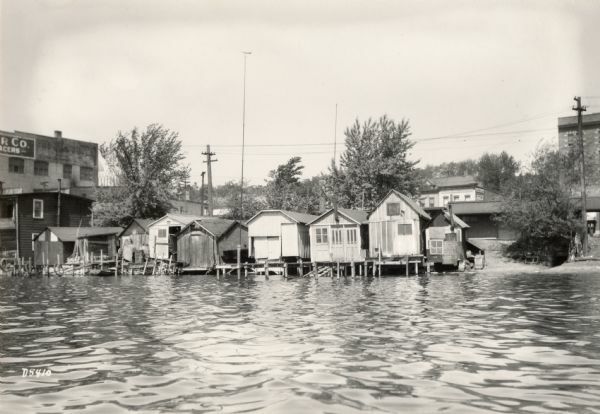 View from the lake of a row of boathouses on Lake Monona at East Wilson Street between South Hancock and South Franklin Streets. Such as home display or a gift. Such as publication, web, public display or film. 10-percent discount for Society Members. Image-purchasing questions? Please Contact Us. This image is issued by the Wisconsin Historical Society. Use of the image requires written permission from the staff of the Division of Library-Archives. It may not be sold or redistributed, copied or distributed as a photograph, electronic file, or any other media. The image should not be significantly altered through conventional or electronic means. Images altered beyond standard cropping and resizing require further negotiation with a staff member. The user is responsible for all issues of copyright. Please Credit: Wisconsin Historical Society. To view this image, visit the Archives Research Room on the 4th floor at the Society Headquarters building in Madison, WI. Print out this index page and present it to the librarian. Use the links below to plan your visit to the Society's Archives. Visual materials in the Archives do not circulate and must be viewed in the Society's Archives Research Room. Wisconsin Historical Society, Creator, Title, Image ID. Viewed online at (copy and paste image page link). Wisconsin Center for Film and Theater Research, Creator, Title, Image ID. Viewed online at (copy and paste image page link). Contact our Archives staff by email. The "Teenie Weenies" cartoons enchanted readers of all ages for more than 50 years. View this selection of cartoons by William Donahey. Explore Jim Widmer's photographs of the Friday fish fry dinner tradition in Wisconsin. Ever wonder why beer is so popular in Wisconsin? Wisconsin history is full of breweries and beer.